Talent acquisition refers to all the different ways you maintain talent at your business — whether that’s keeping up on social media, using metrics to master you hiring timetable, or everything in between. Though often used interchangeably with ‘recruitment,’ talent acquisition is a much broader concept. Employer Branding: Create an online presence that attracts top talent. Attractive Workplace: Make your workplace the envy of competitors. Interview Wisely: Identify and secure the best possible candidates. In a perfect world, you’re never straining to find talent because talent comes to you. This is how businesses like Google and Tesla get by. By upholding reputations as ‘cutting edge,’ and great places to work, top talent lines up to apply. While we can’t all be innovative tech giants, you can be a superstar in your industry and local community. In fact, whether you’re aware if it or not, you probably have a reputation already. Understanding what people are saying is the first step to curating your image, and then making your business attractive to potential employees. Before you can establish a positive reputation, you need to look out for (and address) any negative press. In particular, what are past or present employees saying about you? If nobody is saying anything about your business, you’ll have to get the ball rolling yourself. 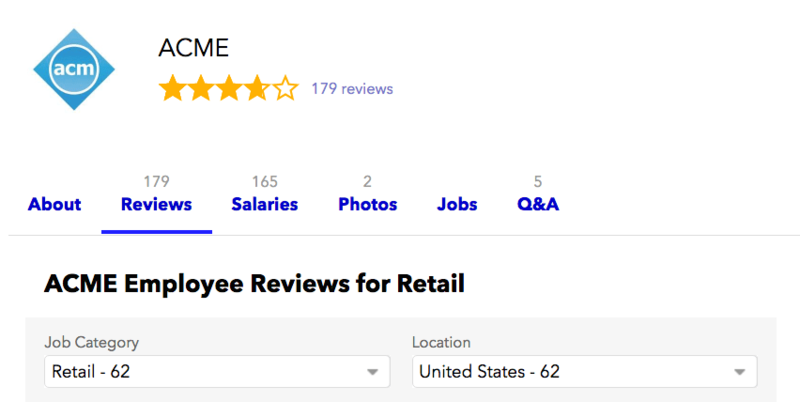 Two of the top places employees leave reviews are Indeed.com and Glassdoor, so start there. For Indeed, make sure you set up or “claim” your company page so you can add more details about your business. Then, ask your current and former employees to leave reviews. If you find reviews already written, you’ll likewise want to claim your company pages so you can begin responding to them. Especially for negative reviews, it’s essential to respond and tell your side of the story. Being told to get on social media is like hearing broken record player. We’re here to you something different. Yes, get on social media, but don’t waste time on channels that don’t pay off. Find out where your potential talent base is hanging out, and focus your energy there. It’s better to do well on one or two channels than the spread yourself thin. For sales and marketing positions, this means using LinkedIn. For publishing and PR, this means Twitter. For design and fashion, this might be Tumblr, Pinterest or Instagram. Videographers have Vimeo, developers have StackOverflow — you get the idea. Next, stay active on the channels you select. Focus on being a helpful resource first, and a provocative brand second. This might mean offering professional advice, responding in forums, posting unique content, and so on. First and foremost, you need a website. It sounds obvious, but over half of small businesses still lack websites, and many others lack modern features, like mobile-optimized web pages. Fortunately, it’s easier and cheaper than ever to create a website, and we have a guide that covers exactly how. Next, you’ll want to make sure your website is routinely updated. In particular, make sure you have a careers page that lists your latest openings — after all, what’s the point of building an online following if prospective candidates can’t see your listings? Indeed lets you create a custom-branded careers page for free, which will automatically update when you post a job on their site. While technology plays a big role, it’s not the only way you need to stay current. You need to ask yourself questions like, is your office still located where the major labor pool resides? It may not be the same as it was 10 years ago. Or, are your work policies like vacation up-to-date and competitive? We’ll look more at these workplace factors next. 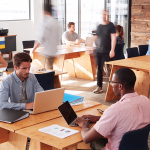 If the first step to talent acquisition is improving your online reputation, the next step is living what you preach: Make your workplace the envy of competitors by compensating fairly, offering benefits, and making employees feel valued with recognition and paths to promotion. Over time, a culture of employee respect will contribute to your growing reputation — with both Indeed reviews, social media mentions, and natural word-of-mouth. This leads to another key aspect of talent acquisition: employee referrals. The more excited employees are about working for you, the more likely they are to recommend skilled friends and colleagues. We’re not saying you need ritzy salaries to be as a great place to work. However, you do need fair salaries, followed-up with benefits and perks that are valued by your employees. First and foremost, take a look at what your competitors are paying. 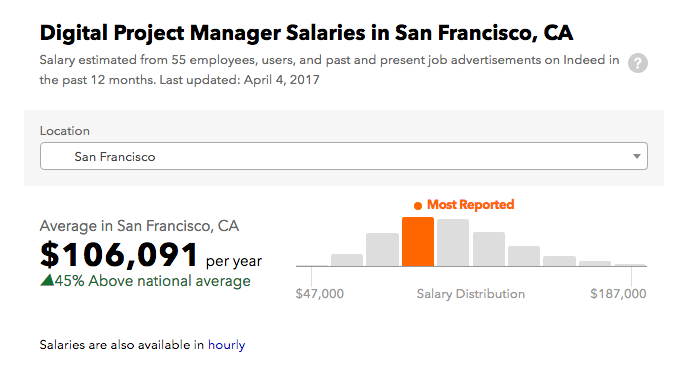 Using Indeed’s salary comparison tool, you can find the average salary for a specific job role in your city. Below that, you’ll also see what specific companies are paying. While there’s a lot more factors that go into this (like your specific industry and business size) you should get a general idea how your salaries compare. By and large, you want them to be at or above the market level. Although, benefits, perks and bonuses can also play a big role. If you can’t afford raises, offering certain benefits can actually have a higher perceived value to employees. 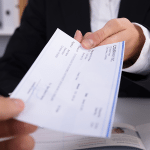 For skilled salaried positions, you should almost certainly consider health insurance if you aren’t offering it already. Other ideas include commuter benefits, life insurance, retirement matching, or even increasing paid time off. All of these can have a big impact on employee morale, and help make your positions more attractive to potential candidates. Check out our other guides to learn more about setting compensation and offering benefits. If you’re wondering how else you could improve your workplace, there’s an easy way to find out: ask your employees. You’ll often find simple, reasonable adjustments you can make to improve the quality of your office — like stocking a new brand of coffee, clearing the patio space, offering weekly lunches, etc. Just as you’re always trying to improve your product or service, you should always strive to improve the quality of your workplace. Not to mention, you want employees to feel comfortable approaching you. If they can discuss the little things, they’ll feel more comfortable bringing up bigger ideas or concerns, which lays the foundation for a stronger, lasting relationship with your business. Establishing a strong employer reputation will get you far, but alone, it’s not enough to fill your seats with great employees. Next, you need a solid application process that will help you identify and secure the best possible candidates. After all, what’s the point of doubling, tripling, or heck, quadrupling your number of applications if you can’t review them all? The secret is to automate as much of the process as possible. First and foremost, you should be using online job boards, which make it easier than ever to promote, receive and review job applications. Indeed is the biggest job board in the US, and especially great for salaried positions. Other websites are good for wage positions (Craigslist), freelancers (Upwork) or industry-specific jobs. You can check out our full list of the top job posting websites. Employers often underestimate how much their job description will persuade (or dissuade) good candidates. In fact, 1 in 5 candidates will skip your application if it takes longer than 20 minutes to submit. At the same time, you need to make your business stand out — so it requires a careful balance of detail and brevity. We have a guide on how to write a job description that provides a template and explanation of each section to include. When you post on a free job board like Indeed, your ad becomes visible to anyone searching in your area. For some businesses, this alone will yield enough qualified candidates. However, oftentimes, you’ll want to do more to maximize your potential reach. Indeed has another feature called resume search, which allows you to browse passive candidates who fit your description. These are candidates who are not actively looking for a job, but might still consider an offer, especially if it’s more attractive than their current situation. On the flipside, you can pay to “boost” your job ad, so it’s visible to even more people searching for jobs. We cover this option more in our guide on how to get the most out of your Indeed job posting. Once the applications come flooding in, you’ll need a plan on how you’re going to review them. With Indeed, you’re provided a simple application management system to review and respond to candidates more efficiently. For example, you can require candidates to answer specific questions about their qualifications — like how many years experience they have managing salespeople, or whether or not they hold a bachelor’s degree. Then, the system will automatically earmark candidates who meet your requirements so you don’t have to review every one of them manually. Create a questionnaire on your Indeed job ad. For candidates who do not meet your requirements, send a pre-written rejection email. For those you want to move forward with, send an invite to a phone interview. Indeed includes built-in email templates, so you can immediately fire off these messages. To learn more about posting a job ad on Indeed, check out our full guide here. A common challenge of hiring is figuring out who to interview. On the one hand, you want to speak with as many qualified candidates as possible. On the other hand, interviewing takes time, and you hate to waste productive hours on interviews that aren’t going anywhere. The trick is to start with short phone interviews before inviting anyone to your office. Getting on the phone with candidates for 15 or 20 minutes will give you a clear idea who you want to move forward with, and who isn’t quite making the cut. Your questions should be straightforward, focused mainly on their application and work history. Confirm that 5 years of social media experience means successful campaigns with strong ROIs — not just posting selfies. On that note, it’s important to stay on-point during your phone screens and in-person interviews. You want to ask roughly the same questions to each candidate, so that, based on their responses, you can compare and rank candidates more objectively. Staying on script also avoids any uncomfortable situations that could be damaging to your business. First off, 34% of candidates who have a bad interview experience will tell their social networks. So if a candidate isn’t the one, make sure you’re letting them down easy. Secondly, asking an illegal interview question can be grounds for a lawsuit, so make sure you keep an eye out for those as well. For all these reasons, it’s best to error on the side of safety with a list of predetermined questions. You can check out our list of the top interview questions to start building your own interview script. Be sure to pull together any other hiring managers (especially those who will be working with the new employee) and begin a final run-through of your top candidates. If any of these sound unfamiliar, check out our full hiring guide, which covers these steps in more detail. It’s probably not what you want to think about after a lengthy hiring process, but talent acquisition hardly ends after a successful hire. You may have more positions to fill yet, more coming soon on the horizon, or you’re simply anticipating future growth and turnover. Either way, no talent acquisition strategy is complete without a plan for future hires. Of course, you can’t always predict the future: You don’t know when an employee will quit abruptly, or when a new contract will surface that requires extra help. However, you can use your HR and hiring metrics to make educated predictions. Your turnover rate tells you the percentage of employees who voluntarily leave your business each year. Tracking your turnover rate is key to anticipate and prepare for unexpected departures. Then, tally up the number of employees who quit throughout the year, and divide this by your number from the previous step. For example, if you had 100 employees in January 2016, and you now have 88 employees in January 2017, then your average number of employees equals (100+88)/2 = 94. Between January 1, 2016 – December 31, 2016, you had 8 employees quit. This would make your turnover rate about 8.5%, which is generally considered healthy; most businesses aim for 10% or less. Armed with this data, you can now predict how many employees will quit in the upcoming year. From my example above, I’ll anticipate 8.5% of my current employees leaving. If we’re planning a big growth year with 100 new employees, I’ll anticipate a total of 12 employees leaving: (88+188)/2 = 138 average # of employees. 138 * 8.5% = 12 employees. You can break things down further by calculating the turnover rate for each department. This way, you’ll be able to estimate how many, say, salespeople, or customer service agents you’ll need to hire. Just note, the data is less reliable the smaller the sample size — if your accounting department has 2 employees, and 1 retired last year, that alarming 50% turnover rate probably isn’t so alarming. Time to Hire — While a typical hiring process takes 4 to 6 weeks, that number can vary drastically from business to business. Understanding your average hiring time helps you plan when to hire, and anticipate how long a position may be open. Average Cost per Hire — This metric calculates the total average cost to hire someone, including job board costs, software, and consulting fees (if you hire a professional). This is important to track, since businesses often underestimate these costs. Offer Acceptance Ratio — What percentage of candidates accept your job offer vs decline? If you have a low acceptance ratio, you should make sure you’re bringing multiple candidates into the final stages of the hiring process. You might also want to scrutinize your compensation and benefits offers, to make sure it’s not turning good talent away. Check out our guide to learn about even more useful HR and hiring metrics. Talent acquisition is an ongoing process. It requires continuous attention to your online employer reputation, careful management of your team, mastery of the hiring process, and — last but not least — a strict adherence to HR metrics. It may sound like a lot of work, but there’s fortunately a lot of tools out there designed to make talent acquisition easier. For example, just by creating a free Indeed employer account, you can start posting jobs for free, manage applications with simple tools, and start building your online reputation.